The California drought has exacerbated some of the challenges farmers face. For example, they have to spend more on water, and not just because there is less to go around. A warmer climate causes water to evaporate faster and can force plants to consume more for the same amount of growth. But researchers at the University of California, Merced, are finding where crops would use water most efficiently so that the state can continue to grow food in the new climate and offering data that can be used any time. Because of the immediate importance of this work, UC Merced graduate student Lorenzo Booth earned top honors at the American Water Resources Association meeting in July 2016. Water footprinting shows units of water consumption per unit of product. This helps water users compare decisions in the same units, that is, by volume of water. Footprints can refer to either the supply-side or the demand-side of a product. The conference was held in Sacramento, a seat for water decision-makers and agricultural production. The program focused on the latest geographic information system (GIS) technologies and strategies for examining land use as it relates to water resources management. With his poster titled “Improved Agricultural Water Use Accounting Through Water Footprinting,” Booth showed his solutions and won recognition as the best student poster presenter in the competition. Through his work with UC Water and Professor Josh Viers, Booth has put his undergrad education at UC Merced and his formidable computer science skills to work. Calculating the water use of a crop in the present and into the future requires massive detailed data sets (~75 GB from PRISM) on modeled local temperature and precipitation; irrigation and evapotranspiration data sets (CIMIS); maps of where crops are grown; and some major computing power. But the spatial modeling is what enables Booth and Viers to envision where crops could be moved to be more water efficient, serving farmers and investors. This approach is both old and novel. It is the kind of “information” natural plants use when colonizing ecosystems, and it is a new focus for the success of farmers as water becomes an increasingly expensive and scarce resource. The drought played big role in defining water footprinting’s importance. 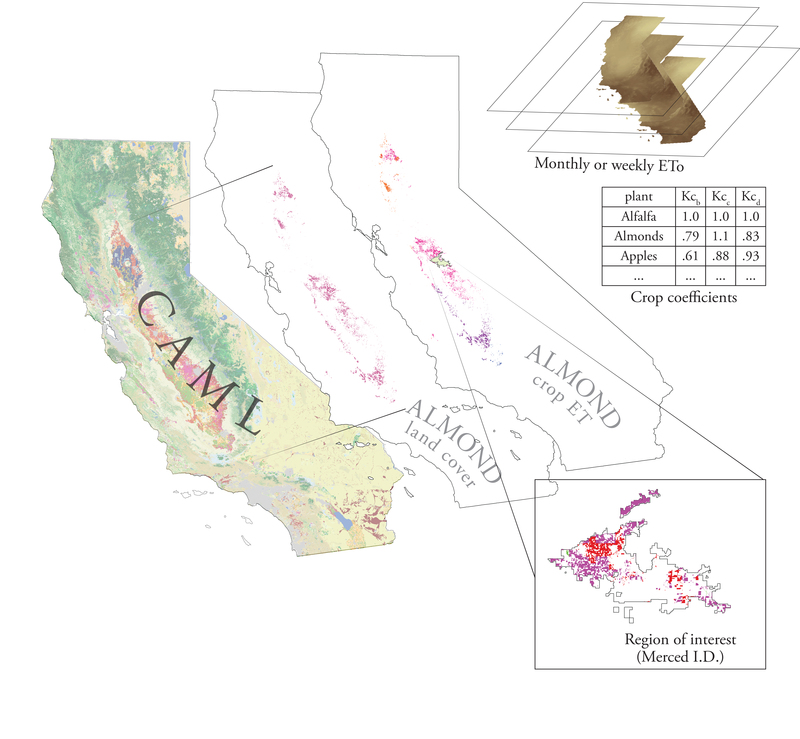 Multiple layers of crop and water use data inform the model of the Central Valley, Ca. “An agricultural footprint assessment tool can serve as a framework to guide efforts beyond the consumptive capture of freshwater,” Booth wrote on his poster.Booth compared two years — the hottest and driest year and the wettest and coolest year — to find extremes in where plants consumed more water in this early analysis. While differences in crops’ water requirements were not as extreme as predicted, water use as a long-term investment could be considered as cumulative. The greatest changes were found in alfalfa and almonds in an analysis that also included corn, cotton, rice and wheat. Booth’s analysis has many applications for farmers and the agricultural industry. He is focused on finishing an interactive tool for water footprinting to inform agricultural planning, especially in the Merced Irrigation District, before he graduates next spring. Booth is working toward his Master’s of Science in Environmental Systems with a specialty in water resources and open-source GIS tools. His future work includes looking at differences in evapotranspiration across the state. Thank you to Lorena Anderson, UC Merced Communications, for editing the article.